Engineer Dad makes safe and fun Nerf Targets for sons. As an avid fan of Nerf toys growing up, I was disappointed that 20 years since playing with my first Nerf blaster that no one had introduced a toy to compliment it. Sure, it’s fun to run around the yard and blast each other but what if you don’t have enough players, friends, or siblings to chase around and battle with? This is a dilemma that often ends with pets, unwilling bystanders, and irreplaceable items getting blasted. And finally, the toy blasters being confiscated to the top of the refrigerator or where ever your mom hides stuff. 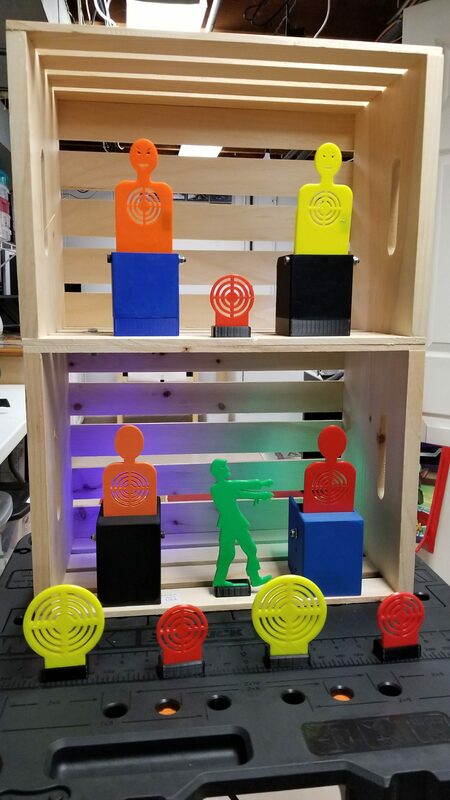 Now as an adult trained in engineering, as well as having tools for producing my designs on the ready, I decided to make some toy targets for my boys and I to enjoy. We quickly realized they were great family fun when others joined in. I was encouraged to share my designs and here on Etsy is where I sell them. Our targets are designed and built from durable materials. The interchangeable colored bases allow for different games to be played to add even more fun to your Nerf passion.